Every project is carried out in accordance with the International Code of Marketing and Social Research Practice compiled by the International Chamber of Commerce and ESOMAR. We closely cooperate with our clients whose success is achieved through permanent project control. Thus we can guarantee strict quality control and optimization of results. Swift performance-related remuneration results in highly dedicated interviewers and high quality studies. 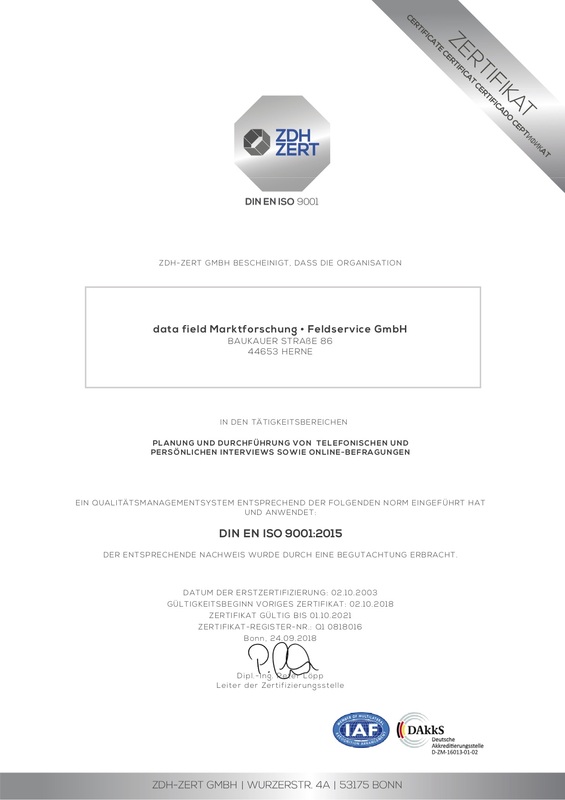 In August 2003, we were awarded the DIN EN ISO 9001:2015 certificate, an internationally recognised quality licence. The stages of certification reveal that our quality management fulfils all its norms and translates all its standards into practice.